"StubHub fully complies with applicable laws. Therefore, we do not allow the resale of World Cup tickets on Stubhub.co.uk," a spokesperson said.However, Ticombo said it was not breaking the law by trading tickets and neither were fans. 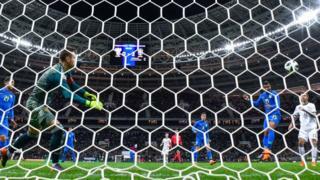 "If Fifa has a problem with fans wishing to sell their ticket to a third party, it has a problem not with Ticombo, but with the free market itself," it said.The 2018 Fifa World Cup kicks off at the Luzhniki stadium in Moscow on 14 June. The final round of ticket sales by FIFA starts on 18 April.More details can be found on its website.Fifa says that strict admission checks will be made on tickets during the tournament and fans will need to have a special identification document to be able to enter the stadiums.Which? urges fans to only buy tickets from authorised sellers. "Football fans need to be aware that if they buy a World Cup ticket from an unofficial source, they risk paying inflated prices and potentially not getting into the game at all," said Alex Neill from Which?. "If you don't want to risk watching the World Cup from the sidelines, you should only buy from the official Fifa reselling website," he advised.